How do you make decisions under pressure? Leadership under pressure is not analysis paralysis. How do you move from analysis to action? In emergency leadership, you have to act, and you have to remain composed under pressure to ensure you have a positive outcome, or at least to find the path to the best outcome a situation affords. These are three principles that will help you lead and perform under pressure. They’re things I learned while serving in the U.S. Army as a front-line combat physician for 15 months while in Iraq. My service in war was one of the longest continuous tours of combat by a physician since World War II. I treated thousands of our troops during that conflict and also provided medical care for Iraq’s deposed dictator, Saddam Hussein, after his capture. When I transitioned to civilian life and became an emergency room doctor, it struck me that the values and principles I learned in the Army also were applicable and equally as important for succeeding in my role as an ER doc, and that they had application beyond those areas to any business or situation. They spoke directly to leadership under pressure. For example, let’s look at the process of triage — quickly evaluating and prioritizing the medical status of a patient or patients. Can you carry the load? Can you do everything? Do you have a clear enough head to recognize what can wait? Do you recognize the value of teamwork and delegation? This is the essence of triage that we perform in the ER on a daily basis, and which is applicable to any business going through a crisis or pressure situation. You’ve got to be able to prioritize, to deal with chaos and make the tough decisions. You have to be very controlled as an individual. You step into the situation and take control. By doing so, you’re filling the vacuum. People will look to you as the leader automatically. Let’s look at the anatomy of a decision under pressure. What physiologically is going on in our bodies? In the brain, the first second the brain receives an impulse that a catastrophe has occurred, the message transmits to other areas of the cortex. How do we control our anatomy so that we can make better decisions under pressure? We have an inner army in our brain, and those soldiers — they’re fighting. They’re fighting those dopamine surges. This inner army has a general. Salute that general. It’s our frontal lobe. It’s the area that controls the logical and rational thinking. When you’ve got that logical and rational thinking in place, it’s time to articulate your thoughts and start giving direction by recruiting a team if none is around you or telling your team exactly what needs to happen and in what order. Divorcing emotion is extremely critical. You’ve got to keep your head about you. By keeping calm when chaos is flying all about you, you exude confidence and have a calming effect on others around you. If you try to jump into the chaos and take charge, you’re likely to make more emotional decisions in the moment and contribute to escalating chaos. By taking a step back and divorcing yourself from that emotion and chaos, you have the best chance of de-escalating the situation and getting those around you to help gain control and overcome the situation. Courage isn’t the absence of fear, it’s realizing there’s something greater than that and going forward and doing your job. When I speak to corporations, I always consider their mission, goals and direction and have been able to draw the parallels between those and what experience and training — leadership under pressure, or “emergency leadership” taught me when I was in the Army. One day, grenades will fly into your world —whatever that world is, whatever that trauma is. Decisions lead to habits. And habits lead to character. 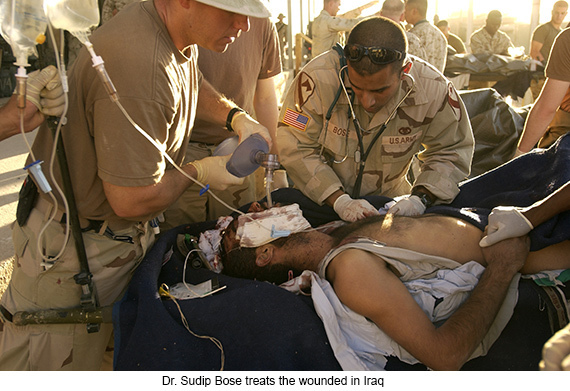 For more about Dr. Sudip Bose, MD, please go to SudipBose.com and his nonprofit TheBattleContinues.org where 100% of donations go directly to injured veterans.